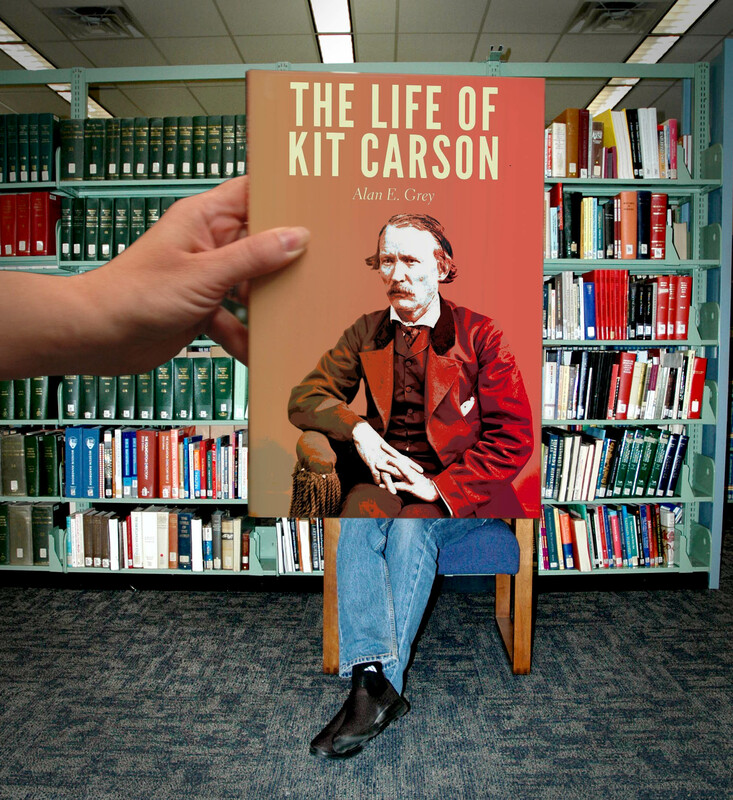 This #BookFaceFriday might not be the king of the wild frontier… but it’s close. “The Life of Kit Carson” by Alan E. Grey (Bison Books, 2014) is a great reference for young readers exploring the old west. As part of our permanent collection it’s available for check out to anyone. Just ask our amazing Information Services staff! This title is published by the Bison Books, and imprint of University of Nebraska Press, which we collect from for our state document program. This week’s #BookFace model is Nebraska Library Commission’s Business Manager, Jerry Breazile! ALA recently introduced “Libraries = Strong Communities,” a national advocacy effort aimed at highlighting the value of academic, public and school libraries. This initiative is uniquely positioned to ignite public awareness of the value of libraries and library staff and create a groundswell of support at the local, state, national and global level. “Libraries = Strong Communities” will include messaging used in conjunction with ALA’s Libraries Transform public awareness campaign. Publicity tools, including a press release template, flyer, Because Statements, and Facebook frame, will be available for participating libraries as well as advocates at large. Additional information regarding the tour will be available within the next few weeks, and those interested in following tour activities in real time may follow the hashtag #LibrariesStrong. This #BookFace isn’t our first rodeo! Set in Nebraska against the background of Buffalo Bill’s Wild West Exhibition, and written by a Nebraska author “Unbridled Dreams” by Stephanie Grace Whitson (Bethany House, 2008) is one of our most popular book club kits. We’ve been wanting to use this book for a while now, but it is almost always checked out. Take a wild west adventure with seventeen year old Irma, as she pursues her dreams even if they go against her mother’s wishes. If I were you, I’d add this Nebraska title to your book club list today! 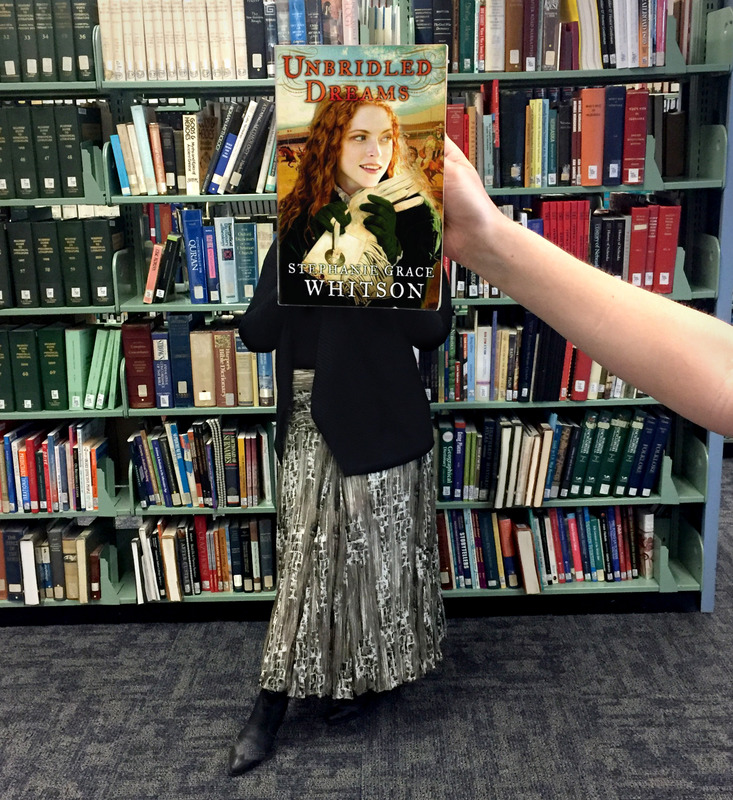 This week’s #BookFaceFriday model is our Library Technology Specialist, Holly Woldt! There’s still time to nominate the next Nebraska Book Award winner! Have you read any good Nebraska books lately? If you have, you can nominate them for a book award. The 2018 Nebraska Book Awards program, sponsored by the Nebraska Center for the Book (NCB) and Nebraska Library Commission, will recognize and honor books that are written by Nebraska authors, published by Nebraska publishers, set in Nebraska, or relate to Nebraska. Books published in 2017, as indicated by the copyright date, are eligible for nomination. They must be professionally published, have an International Standard Book Number (ISBN), and be bound. Books may be entered in one or more of the following categories: Nonfiction, Fiction, Children/Young Adult, Cover/Design/Illustration, and Poetry. Certificates will be awarded to the winners in each category. Award winners will be presented at the Fall 2018 Nebraska Center for the Book’s Celebration of Nebraska Books and Annual Meeting in Lincoln. The entry fee is $40 per book and per category entered. Deadline for entries is June 30, 2018. For more information, including entry forms, see http://www.centerforthebook.nebraska.gov/awards/nebookawards.html or contact Mary Jo Ryan, 402-471-2045, 800-307-2665, for print information. Enter by sending the entry form (http://www.centerforthebook.nebraska.gov/docs/BookAwardsEntry2018.pdf), three copies of the book, and the entry fee to NCB Book Awards Competition, Nebraska Library Commission, The Atrium, 1200 N Street, Suite 120, Lincoln, NE 68508-2023. I need a 100 cc’s of teddy bear stuffing, STAT! Just kidding. Unlike this week’s #BookFace author, we didn’t actually need to do any doctoring for this week’s photo. 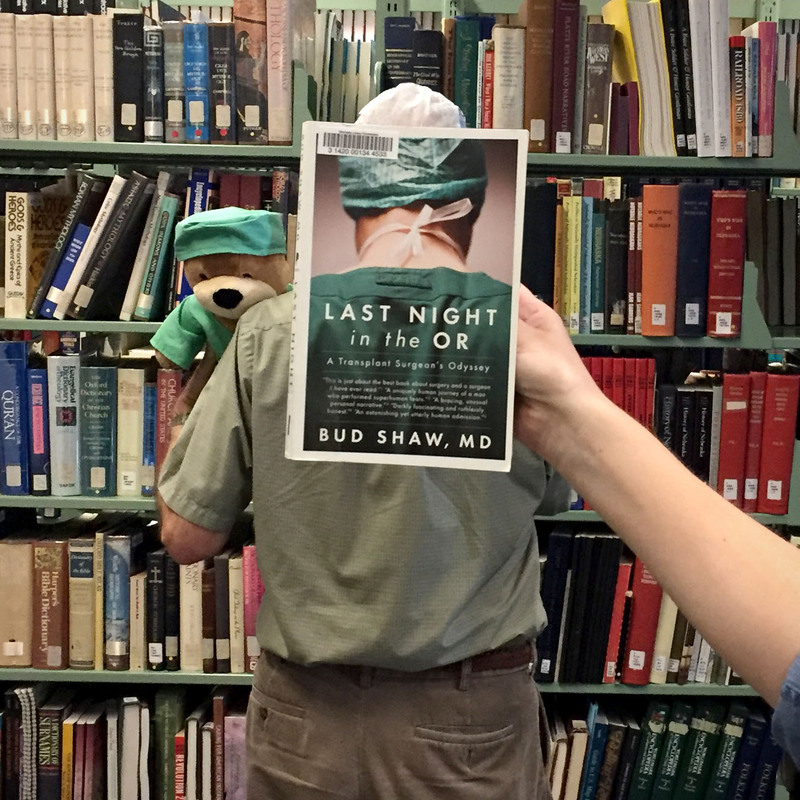 “Last Night in the OR: A Transplant Surgeon’s Odyssey” by Bud Shaw, MD (Plume, 2015) is the fascinating memoir of retired surgeon, Bud Shaw. It follows his journey in medicine, more specifically, the revolution in the field of liver transplantation. This Nebraska author tells us stories from his days in medical school to opening a world renowned transplant center in Omaha. As a part of our NLC Book Club Kit collection this memoir is a perfect non-fiction choice for your book club’s next read! This week’s #BookFace model is our Computer Services Director, Vern Buis. He may not perform surgery on humans or teddy bears, but he always diagnoses and cures our sick computers. 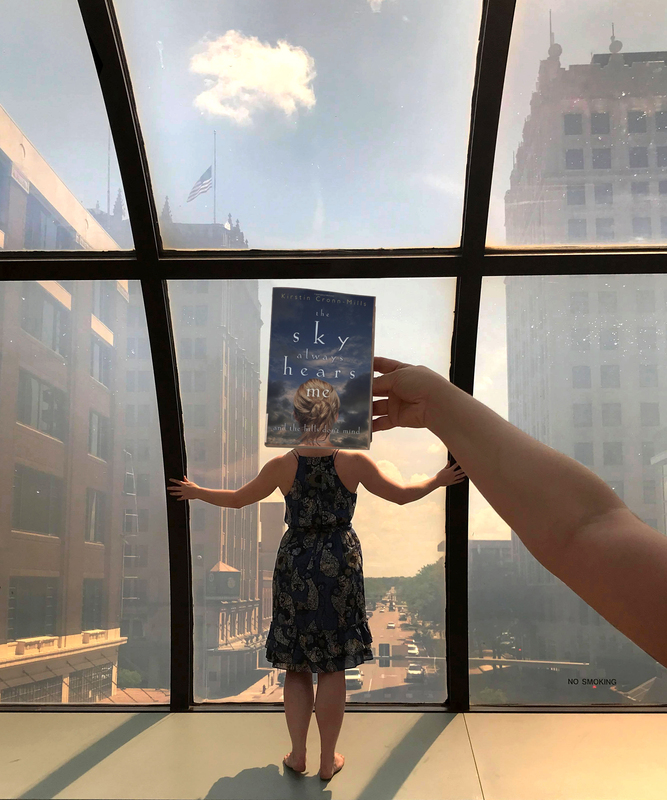 This week’s #BookFaceFriday has us dreaming of blue skies, as far as the eye can see. This week’s #BookFace selection is all about growing up in a small town & fortune cookie wisdom. I like to think it’s about my own small town, where nothing especially exciting ever happens and yet somehow, high school is still full of drama. Just like Central Nowhere, the setting of this week’s selection, by Nebraska author Kirstin Cronn-Mills, “The Sky Always Hears Me: And the Hills Don’t Mind” (Flux, 2009). The perfect coming of age YA novel for a summer book club read. And since this book is in our NLC Book Club Kit collection, it should definitely be on your TBR list! A children’s picture book that encourages us all to remember that we hold the key to our days will represent Nebraska at the 2018 National Book Festival. 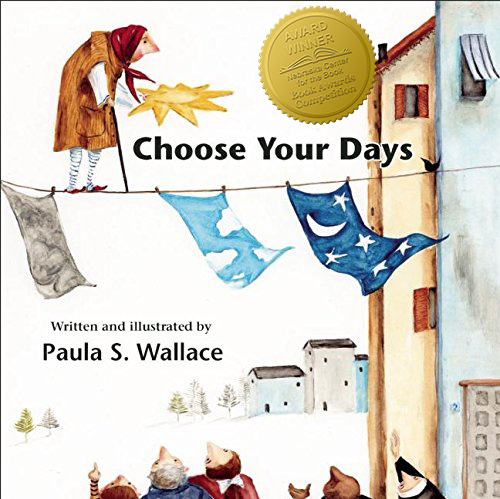 The Nebraska Center for the Book selected Choose Your Days by Paula Wallace (Cinco Puntos Press, 2016) as the state’s selection for the National Book Festival’s “Discover Great Places through Reading” brochure and map. Each state selects one book about the state, or by an author from the state, that is a good read for children or young adults. The brochure and map will be distributed at the September 1 Festival in Washington DC and will be featured in the “Great Reads about Great Places” links on the websites of both the national and Nebraska centers for the book. This book, written and illustrated by Omaha artist Paula Wallace, tells an engaging story of a child learning to live her dreams to the fullest. The bright and whimsical illustrations sweep the reader along through the story and help deliver a powerful message about love and loss. Nebraska’s “Great Reads about Great Places” book is chosen from the previous year’s Nebraska Book Award winners and this book was awarded the 2017 Nebraska Book Award in the Children’s Picture Book category. Entries for the 2018 Nebraska Book Awards will be accepted until June 30—see http://centerforthebook.nebraska.gov/awards/nebookawards.html. The National Book Festival will feature presentations by award-winning authors, poets, and illustrators at the Walter E. Washington Convention Center in Washington, DC. Festival attendees can meet their favorite authors, get books signed, have photos taken with mascots and storybook characters, and participate in a variety of learning activities. States will staff exhibit booths to promote reading, library programs, and literary events. Find out more about the 2018 National Book Festival (including a list of featured authors) at http://www.loc.gov/bookfest. Nebraska books and writers will be featured and celebrated at two events in Lincoln, so save the dates for the Nebraska Book Festival on August 25, 2018 and Celebration of Nebraska Books on October 27, 2018. These two events will highlight work by Nebraska writers and publishers, featuring stories and poetry set in Nebraska. The October 27 Celebration of Nebraska Books will be held at the Nebraska History Museum, 131 Centennial Mall North. The winners of the 2018 Nebraska Book Awards—Nebraska’s prestigious awards for literacy, writing, and publishing—will read from their winning books and sign copies of the books. Nominate books for the Nebraska Book Awards at http://centerforthebook.nebraska.gov/awards/nebookawards.html. 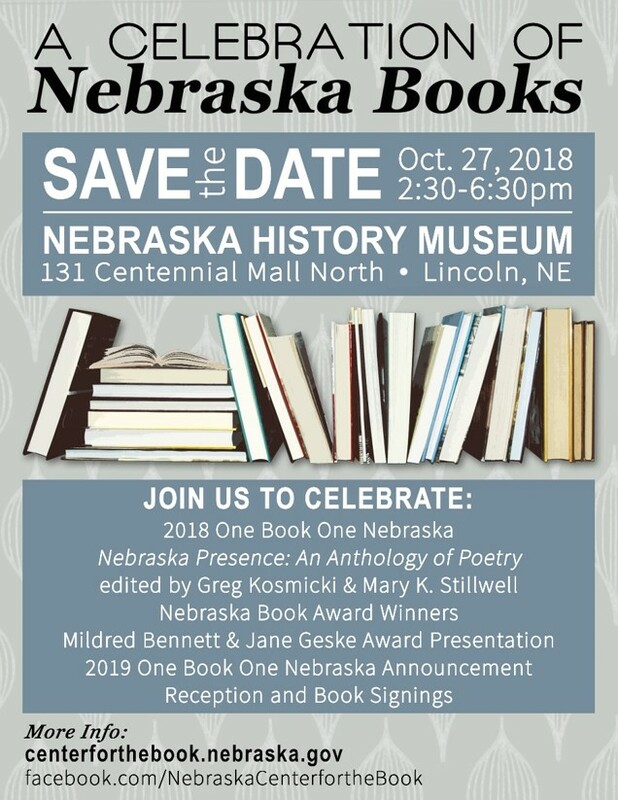 The Celebration will also feature poetry readings in honor of the 2018 One Book One Nebraska book selection, Nebraska Presence: An Anthology of Poetry (The Backwaters Press, 2007) edited by Greg Kosmicki and Mary K. Stillwell. Awards will be presented to supporters of Nebraska writing. The Mildred Bennett Award will recognize an individual who has made a significant contribution to fostering the literary tradition in Nebraska, reminding us of the literary and intellectual traditions that enrich our lives and mold our world. The Jane Geske Award will be presented to a Nebraska organization for exceptional contribution to literacy, books, reading, libraries, or literature in Nebraska. It commemorates Geske’s passion for books, and was established in recognition of her contributions to the well-being of Nebraska libraries. Nomination forms are available at http://centerforthebook.nebraska.gov/nominationforms.html. The Nebraska Cen­ter for the Book An­nual Meeting will be held at 1:30 p.m.—just prior to the Celebration of Nebraska Books. An Awards Reception honoring the winners, book signings, and announcement of the 2019 One Book One Nebraska book choice will conclude the festivities. The 2018 Celebration of Nebraska Books is sponsored by the Nebraska Center for the Book (NCB), Nebraska Library Commis­sion, and History Nebraska—with Humanities Nebraska supporting the One Book One Nebraska presentation. For more information see http://centerforthebook.nebraska.gov/programs/celebration.html and https://www.facebook.com/NebraskaCenterfortheBook. What could motivate Nebraska young people to write letters? A great story and the opportunity to tell an author about how a book made a difference in their own life can provide just the right encouragement. Teachers and librarians in Nebraska were recently awarded grants to host pilot Letter Writing Clinics for students in their area. The clinics will introduce students to the Letters About Literature contest and letter writing techniques. Students will get ideas for selecting books and learn how to craft letters that can be submitted to the Letters About Literature contest, a national reading and writing promotion program that engages nearly 50,000 adolescent and young readers nationwide in grades four through twelve. The competition encourages young people to read, be inspired, and write back to the author (living or dead) who had an impact on their lives. The annual Letters About Literature writing competition is sponsored nationally by the Center for the Book in the Library of Congress, with funding from Dollar General Literacy Foundation. The Center for the Book was established in 1977 as a public-private partnership to use the resources of the Library of Congress to stimulate public interest in books and reading. The Nebraska competition is coordinated and sponsored by the Nebraska Center for the Book, Nebraska Library Commission, Houchen Bindery Ltd., and Chapters Bookstore in Seward. For more information about the Letters About Literature competition, see http://centerforthebook.nebraska.gov/programs/LAL.html. To learn more about Letter Writing Clinics, see http://centerforthebook.nebraska.gov/programs/LAL_Grant/2018/index.aspx. The Nebraska Center for the Book is housed at the Nebraska Library Commission and brings together the state’s readers, writers, booksellers, librarians, publishers, printers, educators, and scholars to build the community of the book—supporting programs to celebrate and stimulate public interest in books, reading, and the written word. The Nebraska Center for the Book is supported by the Nebraska Library Commission. As the state library agency, the Nebraska Library Commission is an advocate for the library and information needs of all Nebraskans. The mission of the Library Commission is statewide promotion, development, and coordination of library and information services—bringing together people and information. Humanities Nebraska inspires and enriches personal and public life by offering opportunities to thoughtfully engage with history and culture. Humanities Nebraska was established as a state-based affiliate of the National Endowment for the Humanities in 1973. 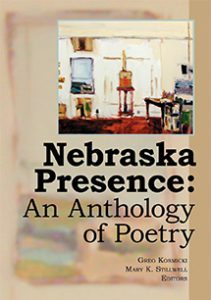 Join us for the next NCompass Live, ‘2018 One Book One Nebraska: Nebraska Presence: An Anthology of Poetry‘, on Wednesday, May 16, 10:00am – 11:00am CT. In this fourteenth year of One Book One Nebraska, Nebraska libraries and other literary and cultural organizations continue to plan activities and events to encourage all Nebraskans to read and discuss the same book. Join us to hear more about this statewide reading promotion activity, sponsored by the Nebraska Center for the Book, Humanities Nebraska, The Backwaters Press, and the Nebraska Library Commission. We are very pleased to announce that our featured guests will be Greg Kosmicki and Mary K. Stillwell, editors of the 2018 selection, Nebraska Presence: An Anthology of Poetry. Learn about how to create a successful local reading promotion using Nebraska’s year-long, statewide celebration featuring Nebraska Presence: An Anthology of Poetry, Edited by Greg Kosmicki & Mary K. Stillwell. Brainstorm strategies to read and discuss Nebraska Presence: An Anthology of Poetry, a collection of poems by more than 80 contemporary Nebraska poets, including Pulitzer Prize winner and former Poet Laureate of the United States, Ted Kooser, Nebraska State Poet Twyla Hansen, former State Poet William Kloefkorn, and many others. Find tools to help engage your community in local activities to encourage them to come together through literature to explore this work in community-wide reading programs. 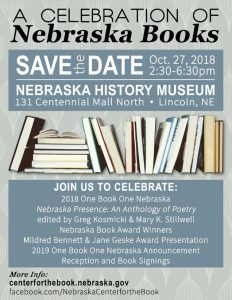 Learn about the Celebration of Nebraska Books, set for October 27, which will celebrate this book, along with the winners of the 2018 Nebraska Book Awards. A long time ago in a galaxy far, far away…. 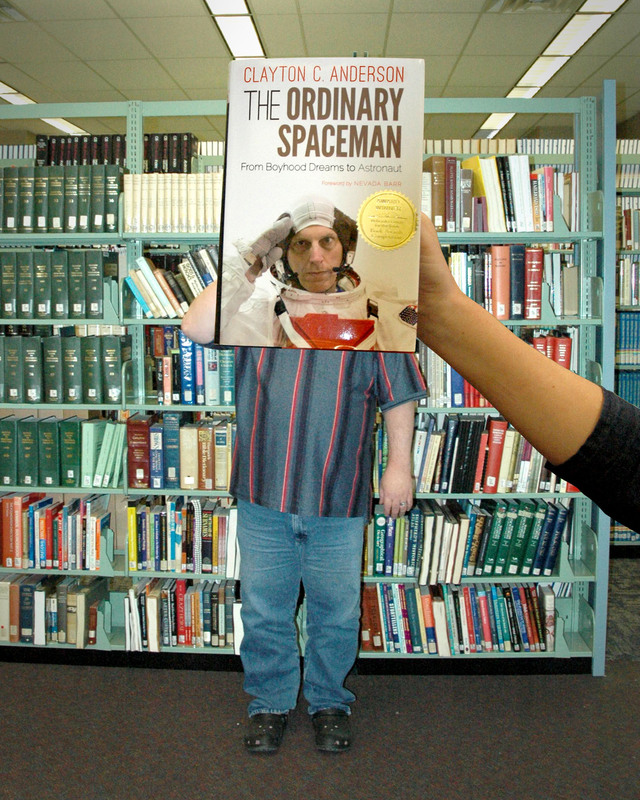 this #BookFace has returned to it’s home planet. May the Fourth be with you! It’s #BookFaceFriday and it’s also Star Wars Day! “I’m just a simple man trying to make my way in the universe.” — Jango Fett. We’re sure Nebraska-born Clayton Anderson would agree with Jango, as he shares his story of growing up to become an astronaut. Anderson’s memoir, “The Ordinary Spaceman” (University of Nebraska Press, 2015) was the winner of the 2016 Nebraska Book Award for Creative Nonfiction. As part of our permanent collection it’s available for check out to anyone. Just ask our amazing Information Services staff! This title is published by the University of Nebraska Press, which we collect from for our state document program. This week’s #BookFace model is Computer Service’s Information Systems Specialist, Dennis Klebe! NCompass Live: Introducing the Nebraska Authors Database! Join us for the next NCompass Live, ‘Introducing the Nebraska Authors Database!’, on Wednesday, April 25, 10:00am – 11:00am CT.
Presenter: Erin Willis, Curator, Jane Pope Geske Heritage Room of Nebraska Authors, Bennett Martin Public Library, Lincoln City Libraries and Karin Dalziel, Digital Resources Designer & Developer, UNL Center for Digital Research in the Humanities.